With his style, Michael Mauer has shaped the form of the 21st century Porsche. By now, every model from Zuffenhausen bears the designer‘s signature. As Head of the Style Porsche, Michael Mauer is responsible for defining the fine line between established identity and progress that not only determines the success of each new model but also defines the brand’s worldwide perception. The expertise of the 53-year-old and his team of over 100 designers, model builders and CAD-specialists naturally extends far beyond the line management of today’s series. A new movie about the development history of the electric concept car Mission E makes this strikingly clear. Will Porsche remain true to its principles? Will Porsche remain innovative? 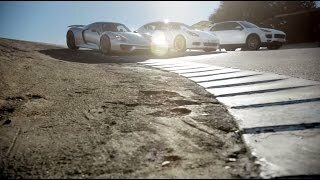 Both questions are answered with a resounding yes in the film about the Mission E. Since becoming head of the design department at Porsche in 2004, Michael Mauer’s work has been confronted with these two questions several times. Take the Panamera as an example: as a completely new model without a predecessor, Mauer’s first project was a showpiece for the fine line between brand and product identity. “There are a few elements that define our brand identity and we stick with those,” says Mauer and gives the hood’s topography as an example. Due to its front engine, the Panamera naturally doesn’t feature the same rollercoaster hood as the Porsche 911. Nevertheless, it mirrors the Porsche icon’s curved bodywork. The pronounced side skirts over the rear wheels are inspired by the 911 as well. A design language for the future? “The technology allows us to turn the architecture completely upside down as we go ahead,” says Porsche’s chief designer. The electric concept study Mission E paves the way. 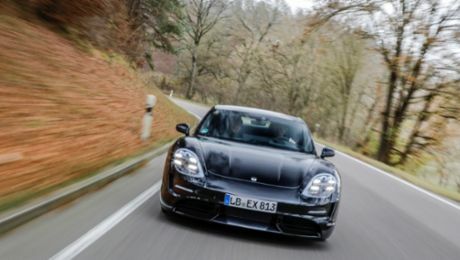 “This car is Porsche’s answer to the electric mobility of the future.” Inspired by the 911, the topography is more pronounced than it was with the Panamera or the Macan, especially in the front of the car. “Simply because there is no motor in the front,” says Maurer, who doesn’t think that continuing with the current designs is the only way forwards. Nevertheless, the Mission E – just like today’s 911, Cayenne or Panamera – is unmistakably a Porsche. Naoto Fukasawa, industrial designer, talks about the purpose of design.